High-Precision Floor Scales are suitable for many industrial applications and can be tailored to meet your exact needs. They stand for high accuracy, long-lasting reliability and the best metrology. METTLER TOLEDO is world renowned for accurate and reliable weighing scales and systems for harsh industrial environments. These high accuracy floor scales are the best choice when you expect the best metrology combined with long lasting reliability. 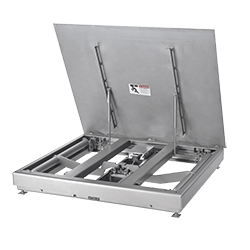 The built-in lever and bearing mechanical structure ensures the scale maintains peak performance, regardless of the application. METTLER TOLEDO, with its comprehensive range of globally-approved weighing solutions based on two different sensor technologies, can meet the challenge of just about any filling requirement. This guide will explore the different technologies in use today, along with their advantages and disadvantages so you can improve the performance of your filling technology and operations.